I love to come up with prompts that spark some sort of creativity in kids. A box can be imaginary or real, and the activities it suggests are only limited by children’s imaginations. They might choose one prompt and create a little video or audio presentation about what it suggested to them. They might transform a real box somehow and go on to write a story with that box a key element of the plot. They might get their paints out and go wild with a psychedelic box exterior, or one that represents how they feel about some key issue. They might mix and match to combine elements into a new prompt they prefer. There is no right or wrong thing to do with a prompt, it’s just the beginning… Below I’ve divided the prompts into two sections, imaginative and practical, to make it easier for you to read. ** Just think for a moment about the possibilities in a box. Can you imagine what sort of box it might be? Will you make something with it, or is it some kind of peculiar box, one with amazing powers perhaps? ** You are exploring the attic in an old house when you stumble over a box. What does the box look like? Is there any sound in the attic or is it quiet? How does the box make you feel? Do you want to open the box? What could possibly be inside it? When you do open it, how does it sound or smell? What’s inside? Is it something that leaps out and makes a noise, or is there only a paper of some kind and a creepy chill suddenly in the attic? What happens next? ** If you found a box containing treasure, what would you do with it? ** Your neighbour has a huge storage container in his backyard. He offers it to you and your friends as a clubhouse. What happens next? ** Your dad’s job is to clean the museum after it’s closed and sometimes he lets you go with him to explore. One night you open a door you’ve never seen before and inside a cold, almost empty room is a big metal box. On the front there are three levers, a red one, an orange one and a green one. What do you do? What happens next? ** Get together with your friends and work out how you can get LOTS of cardboard boxes. Map out a city and use your boxes as buildings. What can you use for roads? Vehicles? People? Traffic lights? Signs? What else will you need? 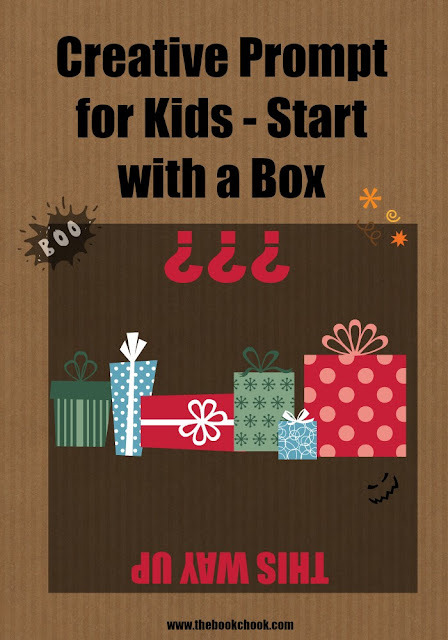 ** Try to find a really big cardboard box and transform it into something special. Will it be a special space to get inside, or maybe a vehicle, or part of some other structure? Could you make it into something that will serve two purposes? Like (say) a cubby AND a toy ramp for cars to slide down? ** Combine a cardboard box or boxes with LEGO to create something new and useful. ** The net of a cube is like a template or map for making a box. What’s the smallest box you can make? What’s the biggest box you can make? An origami box is not exactly the same but lots of fun to research and make. ** Find a box you like that seems the right size to become a home or habitat for something. Decorate the box to make it as cosy, realistic, strange or cute as you like. ** What’s the tallest structure you can make from cardboard boxes that doesn’t collapse when you put a dictionary on top? ** Can you create a castle from a cardboard box and other bits and pieces? Who or what might live inside the castle? Who or what might arrive outside the castle? What happens next? ** Design some furniture using cardboard boxes as the main component. How can you make your furniture strong enough to be used, perhaps in a playhouse? ** Can you turn some kind of box into a game, or a part of a game you would like to play with your friends? What will you call the game? What are its rules? How do you play it? You’ll find all my creative prompts for kids embedded in the Listly list below.